Thanks for the location info. No, it will not be P. erratica, from an urban situation or in a southern lowland area. Last year capture of Pseudeuophrys lanigera in bh14 9hj. grid ref SZ045918, As you can see the markings are different. Sorry new to id of spiders. Last upload could it be Pseudeuophrys erratica. Paul. Came across this jumping spider this morning and need some help with the id. 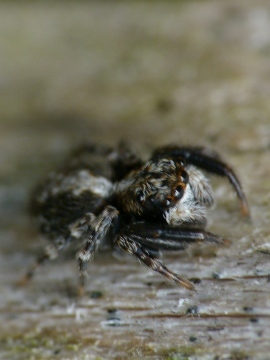 I do find these little jumper so much fun and found 3 species last year in my garden. Could this be a fourth. Great spider record that Richard Gallon has just posted. Looks like a new montane habitat rather than established maritime. New to me anyway. Is that correct Richard? 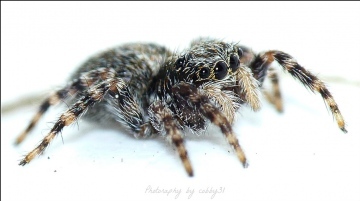 Nice images of an attractive spider as well! Araniella cucurbitina sens. lat. means the species cucurbitina in its old wider sense, either A. cucurbitina or opisthographa, which were for a long time not considered to be separate species but varieties of cucurbitina. A. cucurbitina sens. str. means A. cucurbitina in its strict modern sense, as a distinct species separate to A. opisthographa. It is impossible to identify juvenile or subadult Araniella to species level, although the two widespread species most likely to be encountered are A. cucurbitina or opisthographa. Even examination of the adult female epigynes or male palps under a microscope can present difficulties, since the differences are not always easy to see. I caught an immature male Araniella sp yesterday and tentatively identified it as cucurbitina or opisthographa . I noticed on the SRS site that there are two cucurbitina with the same name but with either sens lat or sens str at the end. What does this mean and is it possible to tell them apart. Can you explain which spider you mean by "the tube web"? Quite a lot of British spiders make webs with tubes. Without a photograph, it is probably not going to be possible to suggest which spider you found. Do not have a photo as I was not prepared but whilst tidying the garden today, found a small spider with a pebble like body and red (almost ginger ) head and legs..legs more at the front of the body. Have never seen one like this before...I hate spiders..totally phobic about them but as this one was so unusual, I googled it which led me to this site. Checked out photos and it looked most like the tube web...However, I live on the south coast where, apparently, they are not normally seen!! !